It’s happy days for those with Irish ancestors, including our own Ellen Jennings. On July 8, Ellen and others of Irish ancestry went to the National Library of Ireland’s website as they released all the Catholic parish records online—and for free! Until now, it required a bishop’s permission to view these records and you had to view them in Ireland. This exciting new database includes the baptisms and marriages from 1086 Roman Catholic parishes throughout all of Ireland from the 1740s up to the 1880s. Before you get too excited, Ellen cautions, there’s a catch. Well, a few catches. I asked Ellen to give me her take on using the digitized Catholic parish registers and here are some of her thoughts. First of all, there is no index or search engine to allow you to look up your ancestor by name and give you the exact page number where you’ll find your ancestors. And many of the handwritten pages are in faded and unreadable handwriting. Also, and this was the biggest stumbling block for Ellen, these records are at the parish level and she does not know the parish of her ancestors. All she knows for sure is the county in Ireland where her ancestors lived. Not to be deterred (and what genealogists is easily deterred?!? ), Ellen set about to figure out where her ancestor Patrick Daly might have been baptized using a range of dates between 1825 and 1830. Roman Catholic parishes are organized by diocese and she found this map of Irish dioceses to be incredibly helpful (you may have to scroll down a little to see the map). 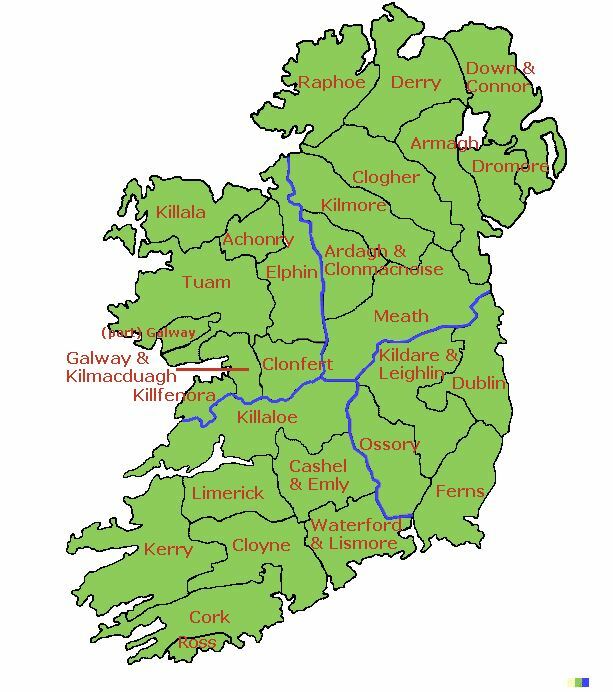 Below the map is a list of the Irish counties covered by each diocese. Ellen’s Patrick Daly was born either in the Diocese of Cork or Kerry. Once you know your ancestor’s diocese, you can enter it into the search engine for Catholic Parishes and Civil Parishes Links c 1837. Click the button next to “RC parish” and choose your diocese from the drop down menu. Leaving the PARISH field blank, click on the blank parish drop-down arrow and you will be given a list of the parishes in that diocese. Write the names of the parishes or make a screenshot of the results. Then the grunt work begins of looking page by digitized page of each parish to find your ancestor. (No one said it would be easy!) Ellen is in the process of going through the parish records looking for her Patrick Daly. The Olive Tree Genealogy’s website has some great suggestions for how to proceed with your search of these records in their 10 Steps to Searching the Irish Catholic Parish Records When You Only Know a County of Origin. If you’ve already found the parishes in your ancestor’s diocese you can start with Step #2. Ellen really likes Lorine’s ideas about how to best organize your search for that elusive Irish ancestor and says she doesn’t think she can do any better in her own search for Patrick Daly’s Irish origins. Ellen adds, Be sure to spend some time looking around the various Irish resources on the incredible SWilson Irish genealogy website.